This is one man's harrowing story of frustration and determination as he battled for access rights to his young daughters following the bitter break-up of his marriage. Incredibly, his was a journey that spanned almost ten years, with 133 hearings by 33 judges, and which reportedly cost the taxpayer over GBP1 million. 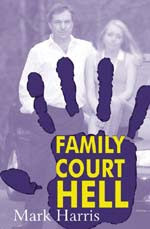 What should have been a "simple contact dispute" somehow resulted in this innocent family man effectively being criminalized by the family courts, resulting in a stretch on the A Wing of the infamous Pentonville prison, which housed convicted murderers, terrorists, gun runners and drug dealers. Mark Harris eventually took his case public and the campaign for fathers' rights took off - with the formation of Fathers 4 Justice. This is a shocking story that deserves to be heard.